CHICAGO — The Office for Intellectual Freedom (OIF) — the voice of the First Amendment in libraries — introduced upgraded tools that make censorship easier to report and easier to track. On Dec. 20, the office rolled out a simpler form to document censorship and hate crime, a web page exclusively for challenge support and an internal database. OIF has documented censorship cases in the literary community since 1990. Last year, the office recorded 275 challenges — requests to remove materials from libraries, schools and bookshops — but surveys indicate that up to 85 percent of book challenges remain unreported. To encourage educators to report censorship, OIF remodeled its form. The new form simplifies the reporting process by reducing the number of questions by more than 60 percent. Educators can now upload documents and receive an emailed copy of their report. The report not only allows OIF to gather challenge statistics, but also to reach out to educators and provide emotional support, media training and case procedure advice. All records remain confidential unless the user chooses otherwise. The redesigned form includes a hate crime category. Since November, seven library hate crimes have been documented by OIF. Hate crimes in libraries include vandalism, harassment and assault that targets specific groups. On Jan. 12, OIF will host “Your Guide to Censorship Reporting,” a free webinar on how to fill out the form. The webinar will also outline how the literary community can identify First Amendment violations and why OIF collects this information. OIF’s Challenge Support webpages migrated from the ALA Banned Books Week page to its own section in ALA’s Professional Tools. OIF Assistant Director Kristin Pekoll said the move greatly benefits librarians. The Challenge Support page hosts the revised reporting form, as well as resources on reconsideration policies, discussions with concerned parents and challenge procedures. Starting Jan. 1, OIF staff will document all challenges in a new robust database, which is commonly used to organize litigation cases. Compared to the previous OIF database, CaseMap features an option to upload documents and a keyword search that enables OIF to spot trends. It also allows staff to record the step-by-step progression and outcome of each censorship case. Staff use the database to generate challenge statistics and compile the annual list of Top 10 Frequently Challenged Books. 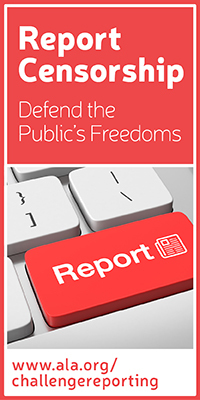 Any community member can help eliminate censorship by submitting a report or contacting the office directly. While most reports address books, OIF assists with canceled speakers, dismantled displays and internet access challenges. The American Library Association’s Office for Intellectual Freedom educates librarians and the public about the importance of intellectual freedom in libraries, as embodied in the Library Bill of Rights. Established in 1967, it offers library resources on a range of intellectual freedom subjects — from privacy and filtering, to collection development and selection policies. OIF provides confidential support to anyone undergoing a material or service challenge. Its annual celebration of Banned Books Week in the fall draws attention to the harms of censorship and the benefits of unrestricted reading.